I LOVE pasta. Really really love. I could eat it all of the time, with many different toppings. I also kinda like it on its own. There’s just something so comforting about a giant bowl of pasta. Meals like this Chicken and Bacon Pasta Bake are fabulous. They’re easy to make, filling and gorgeous. Even better, everyone in the family loves it, and it’s really easy to get plenty veg into. I generally go for peppers, onion and spinach. I love all of the different colours, and the splashes of green are really appetising. 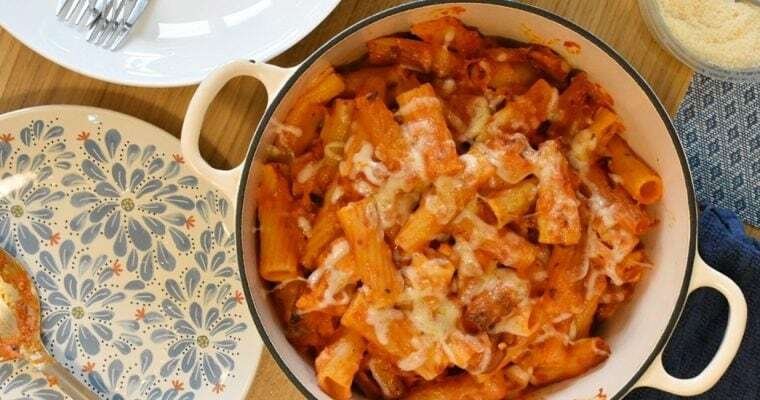 You could add things like cherry tomatoes, courgettes and mushrooms too if you wanted and your Chicken and Bacon Pasta Bake would still taste absolutely wonderful. The only issue I have when I make Chicken and Bacon Pasta Bake and any other Pasta recipe for that matter is portion control. I always make enough to feed about 9000 people, and we end up eating it for a week. Not that there’s anything wrong with that. When I make something like this, I usually end up having to use two large ovenproof dishes and keep one in the fridge for another day. It easily serves 8. When writing my recipe for the rest of you I’ve attempted to get the quantities needed to serve 4, but if there’s absolutely loads still I’m very sorry. Use your own judgement a little bit; I haven’t got any when it comes to pasta. I use half fat crème Fraiche in my recipe to make it a little healthier, but you could also use full-fat double cream if you’d prefer. A fabulous family meal filled with flavour and vegetables. Cook the pasta to pack instructions and leave to one side. Gently fry the chicken in a little oil for 5 minutes until the outsides are browned. Add the bacon and fry for a further 5 minutes. Add the onions, peppers and garlic and continue to cook for 5 more minutes. Pour in the chopped tomatoes and add the oregano, thyme, tomato puree and crème Fraiche and stir together well. Bring to the boil, reduce to a simmer and cook for 15 minutes, stirring often. Add the pasta and spinach to the pan and stir. Cook until the spinach has started to wilt. Tip into a large ovenproof dish. Top with grated parmesan and cheddar. Bake in the oven for 20 minutes, until the cheese is golden brown. I use a fry light cooking spray and 1 yellow and 1 red pepper.